Purpose. To devise experimental and computational models to predict aqueous drug solubility. Methods. A simple and reliable modification of the shake flask method to a small-scale format was devised, and the intrinsic solubilities of 17 structurally diverse drugs were determined. The experimental solubility data were used to investigate the accuracy of commonly used theoretical and semiexperimental models for prediction of aqueous drug solubility. Computational models for prediction of intrinsic solubility, based on lipophilicity and molecular surface areas, were developed. Results. The intrinsic solubilities ranged from 0.7 ng/mL to 6.0 mg/mL, covering a range of almost seven log10 units, and the values determined with the new small-scale shake flask method agreed well with published solubility data. Solubility data computed with established theoretical models agreed poorly with the experimentally determined solubilities, but the correlations improved when experimentally determined melting points were included in the models. 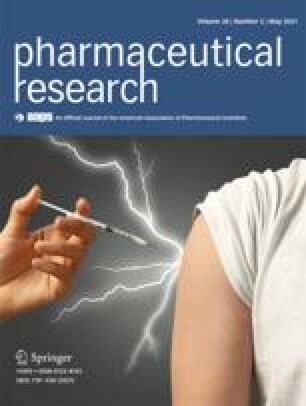 A new, fast computational model based on lipophilicity and partitioned molecular surface areas, which predicted intrinsic drug solubility with a good accuracy (R2of 0.91 and RMSEtr of 0.61) was devised. Conclusions. A small-scale shake flask method for determination of intrinsic drug solubility was developed, and a promising alternative computational model for the theoretical prediction of aqueous drug solubility was proposed.